The Oklahoma Corporation Commission today denied Attorney General Mike Hunter’s motion to dismiss a pre-approval application for the largest wind energy project in state history. Commission chairwoman Dana Murphy, vice chairman Todd Hiett and longtime commissioner Bob Anthony all signed the order denying Hunter’s motion, clearing at least one hurdle for the Wind Catcher development proposed by Public Service Company of Oklahoma. Hunter argued his motion before the commission Thursday, Dec. 21, saying that the company had not proven a need or benefit for the project, which PSO says would be the second-largest wind energy effort in the world. The Commission has jurisdiction over this matter by virtue of Art. IX, Sec. 18 et seq. of the Constitution of the State of Oklahoma and 17 O.S. Sec. 152 and 286. The Commission finds that notice was proper and given as required by law and the rules of the Commission. 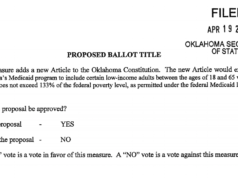 The Commission further finds that the Oklahoma Attorney General’s Renewed Motion to Dismiss should be denied. The Corporation Commission is scheduled to conduct further hearings for the Wind Catcher project’s pre-approval application in January. The Wind Catcher project would include construction of 800 wind turbines west of Guymon, Oklahoma, and would produce power consumed by PSO customers in Oklahoma as well as Texas, Arkansas and Louisiana customers of SWEBPCO, PSO’s sister company. Thursday afternoon, Hunter filed five separate motions that seek “immediate reduction in customer rates from the state’s leading utility companies” following the federal tax reform package recently signed into law by president Donald Trump. Anthony had authored a commentary arguing for utility company savings to be passed on to consumers. NonDoc published the piece today. Hunter’s press release said the Oklahoma Corporation Commission is scheduled to hear his utility rate reduction motions Jan. 4. The release listed estimated corporate tax savings for each of the utility companies he filed motions on. Hunter’s release said the numbers do not include “accumulated deferred income tax”.